At CCTV Camera Pros, we work with many customers who want to display the live video stream from an HD security camera on a TV via an HDMI input. Sometimes these customers have no interest in recording video surveillance footage. They only want a live video view of their camera. For these customers, I recently launched these live video TV display systems for security cameras. We work with other customers who want to display the live view of their camera on a TV, but also want to record video to a DVR. This article will answer the question of how-to connect an HD security camera to a TV’s HDMI video input. It applies whether you only want a live video view or if you also want to record the video. In this article, when I use the term “HD security camera”, I am talking about HD over coax security cameras, also known as HD CCTV cameras. These are cameras that use the same type of coax cable as traditional analog CCTV cameras, except that they support 1080p video resolution (some even higher). You can also learn about how to connect an analog CCTV camera to a TV here. The main challenge in connecting these types of cameras directly to a TV is two-fold. First, they use BNC video connectors and coax cable to transmit their video. Second, most of them use one of the following video standards: AHD, HD-TVI, HDCVI, or HD-SDI (this is the least common). Because of these two factors, you can not simply connect the video output of the camera to the HDMI input of a TV. However, you can use an HDMI video converter to transform the HD security camera video signal to an HDMI signal. 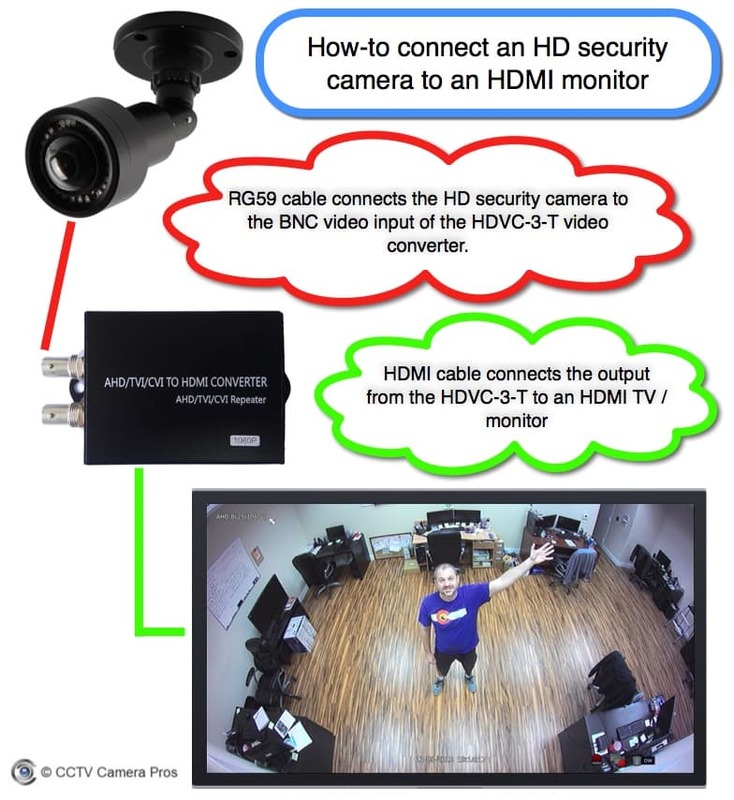 The video output of an HD security camera is connected to the HDMI converter using RG59 coax cable. AHD, HD-TVI, HDCVI, and HD-SDI type cameras can be converted to an HDMI video signal using one of these converters. The HDMI output of the converter is connected to the HDMI input of the TV monitor using standard HDMI cable. If you want to record video to a DVR in addition to having a live video feed displayed on a TV, may be able to use the same converter because most HDMI converters have a video loop output in addition to the HDMI output. The setup is almost the same as only connecting to a TV. In both of the above examples, we are using a 1080p HD-TVI camera connected to a HDCV-3-T HD-TVI to HDMI converter. 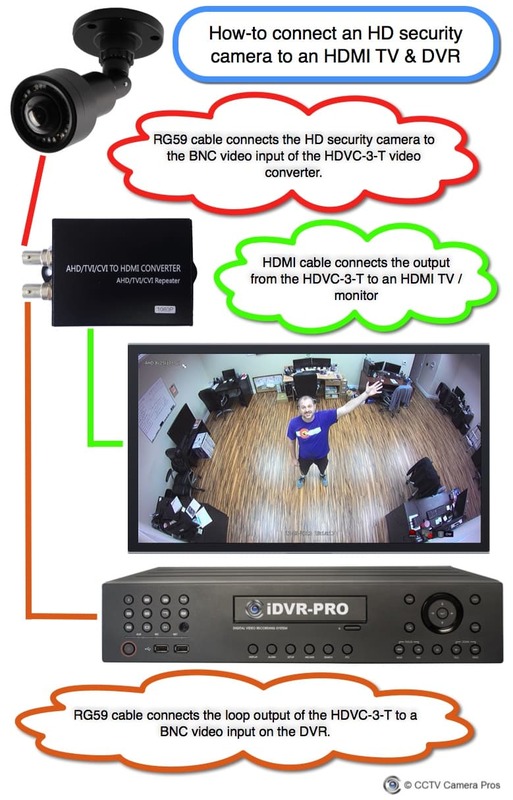 The HDCV-3T has a BNC video output that outputs the same video format and resolution as the input. An additional RG59 jumper cable is used to connect this output to an HD-TVI compatible DVR. The DVR and TV do not need to be installed near each other because HD-TVI video can be run up to 800 feet using RG59 coax cable. Watch this video to see how to connect an AHD security camera to a TV using an AHD camera. This works the same way as the above examples that use an HD-TVI camera. 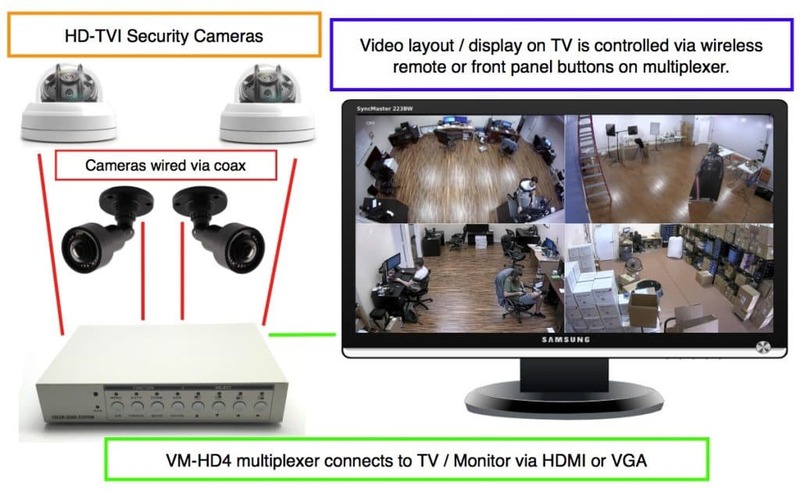 You can read more here about how-to combine the video signal from multiple HD security cameras for live display on a TV by using a CCTV video multiplexer.